Has winter officially hit where you live? It has here (or it did, and is gone again as of today!). Toronto has been experiencing a VERY mild winter so far, with hardly any snow, very mild temperatures and almost no winter jackets required. However, that changed in early January and rather abruptly if you ask me. One day, I was rocking my cherry red rain jacket, feeling at home in this rather “Vancouver” like winter weather, and the next day we were slammed with -25 degrees. Talk about reality shock. Melissa of I Was Born to Cook chose the absolute perfect theme this month for What’s Baking – “Your Favorite Snowday Treat”. I can’t claim cinnamon buns to be my favourite sweet treat, but they are definitely warm, gooey, welcoming and perfect for a day when you are stuck inside with a few extra hours to spare in the kitchen. 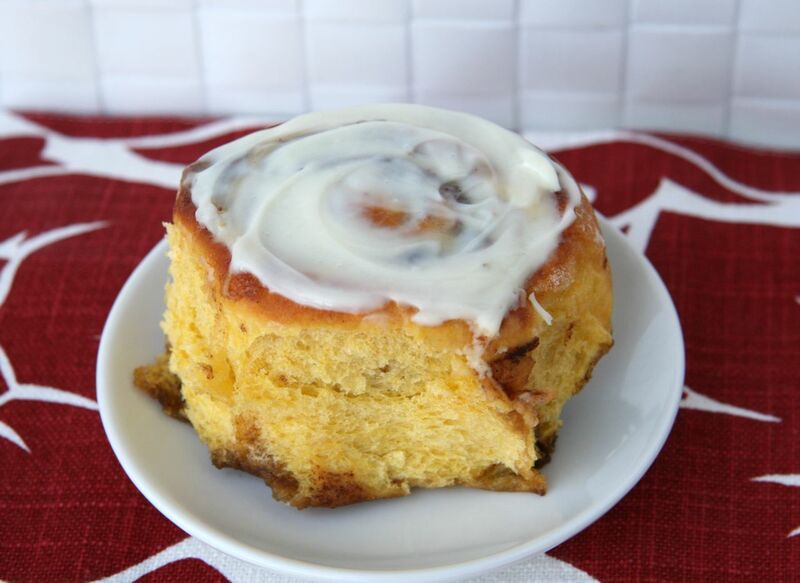 Now, as you read in the title, these aren’t your usual cinnamon buns and they feature a rather unique ingredient – butternut squash. I’ve had a recipe bookmarked for a long time (and when I say bookmarked, I mean bookmarked, not this Pinterest thing that took off about 6 months ago!) However, the one big thing I did change was the unique ingredient – the recipe called for Sweet Potatoes…but when I went to make them, I realized I was out of sweet potatoes. So, I decided to take a chance and replace it with butternut squash. Let me tell you – it worked. It worked oh so well. The butternut squash did not alter the texture or taste that much, but I felt so much better knowing that this usually sinful treat has 2 cups of a healthy ingredient. I also loved that the butternut squash adds moisture and a touch of color to the buns, and it also replaces a lot of the sugar in a traditional recipe. These were hands-down a winner. They took a little work, and a little faith in my baking skills because you have to adapt the flour amount a little due to the moisture levels of the butternut squash, but they turned out beautifully. In a large bowl, sprinkle the yeast and honey over the warmed milk. Let stand until foamy, about 10 minutes. In the bowl of your stand-mixer fitted with the beater blade, place the pureed butternut squash and beat in the egg, oil, and 1 cup of flour – mix until smooth and well incorporated. Add the yeast mixture to your stand-mixer and stir on medium speed until thoroughly blended. Mix in the rest of the flour, 1 cup at a time, blending thoroughly after each addition. The dough should be slightly wet and sticky, but not so much that you can’t form it into a ball, you may not need all 5 cups of flour, or you may need more than 5 cups – use your judgement. Remove the beater blade, replace with dough hook and knead for 8-10 minutes or until dough is smooth and elastic. Form the dough into a ball and transfer to a large oiled bowl. Cover with a clean towel and let rise in a warm spot for about 1 hour or until doubled in size. On a floured counter top, cut the dough in half and roll each into a ball. One at a time, roll each ball into a 16-inch by10-inch by 1/2-inch rectangle. To make the filling, combine the cinnamon, vanilla and sugar in a small bowl. Spread half the softened butter evenly over the rolled-out dough and sprinkle half the cinnamon sugar evenly over the dough. Tightly roll the dough, lengthwise and turn seem side down. Cut into 12 equal slices and place cut-side up on a pie dish – about an inch apart, as they will spread as the rise. Cover the pie dishes with clean towels and let rise in a warm spot until doubled in size, about 20 minutes. Heat the oven to 400˚F. 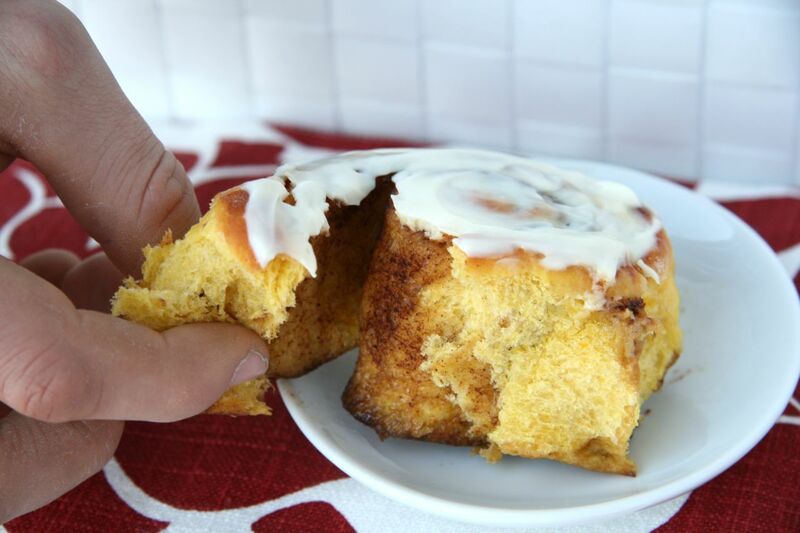 Brush the tops of the cinnamon buns with an egg wash and sprinkle with sugar. Bake for 15-18 minutes, until lightly golden. You don’t want to over bake these or they will dry out. Remove from oven and top immediately with cream cheese icing. Serve warm. Store leftovers, covered, in the fridge. Zap in the microwave for 25 seconds when you want to enjoy. *** You can do all of the steps up until this point, then freeze the dough until you want to use. The day you want to enjoy cinnamon rolls in the morning, all you have to do is pull the frozen dough out the night before, cover with a towel and let stand over night. In the morning you just preheat the oven and pop them in. Easy-peasy. Preheat the oven to 400 degrees. Wash and thoroughly dry the butternut squash. Place in the oven and bake for 45 minutes to 1 hour. You will know it’s ready when you can slide a butter knife through the stem without any resistance. Remove from oven, place on a plate and allow to cool. When cool enough to handle, cut squash in half, remove seeds. Then, using a spoon, remove all of the flesh and place in a bowl. Mash with the spoon, or puree with a stick-blender. If you asked CH what appetizer must be at a party/get-together he would say “Buffalo Chicken Dip” and “7 Layer Dip”, without even hesitating. He loves both of them and will basically stand beside the table until he’s gotten his fix (which is usually the whole thing). We had a Friday night appetizer night at home a couple weeks ago, just the two of us, and this was one of the first things he asked for. It’s such an easy dish to make, it’s fairly healthy and in my opinion it looks so pretty (until the end that is!). I’ve lightened up this recipe, as I don’t use cream cheese or a lot of cheddar cheese, but there are so many variations that you can switch it up if you like. 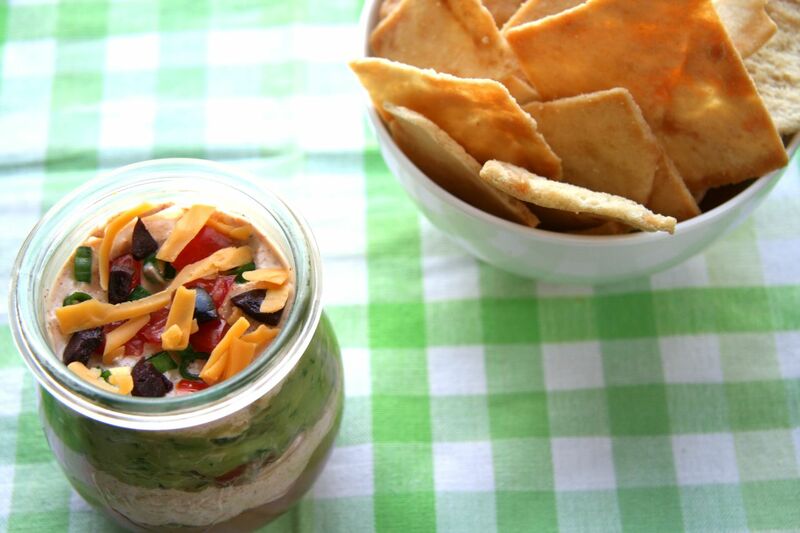 Of course, you can also buy this dip pre-made at the store (Costco makes a great one!) but home-made is always better in my opinion. I took it a step further and made my guacamole from scratch and my taco seasoning and I cannot tell you how much better it tasted – CH claimed it the best he’s ever had (yes, I know…that acclamation happens often around here, what can I say, I’m lucky!). My next step is making the refried beans from scratch, but I have to be a little more organized for that. In any event, with the big football weekends coming up, this would be a great appetizer. As my photos showed, I styled it in individual cups (mine was a little small! ), which I think is such a stellar idea for a party – you can double dip all you want, without worrying. Plus, I just think it looks so stylish. I cannot take credit for this idea, for I saw it on Pinterest – which has many upon many good ideas. PS – I got excited styling my container to photograph and totally switched-up the layers – hence two sour cream layers, whoops! Select your serving dish – I used a 7×5 Emile Henry personal lasagna dish, which was perfect for this. Since this recipe isn’t strict, use whatever you have on hand and just adjust accordingly, you may have a little leftover that doesn’t fit, but oh well, it’s perfect for a snack tomorrow! On the bottom of the pan, spread an even layer of the refried beans. Next, layer the guacamole. Mix together the sour cream and the taco seasoning in a small bowl, and then evenly layer it on-top of the guacamole. Top the sour cream layer with the grated cheese, olives, tomato and green onions. I try to make this ahead and let it chill in the fridge, covered, for at least a couple hours. 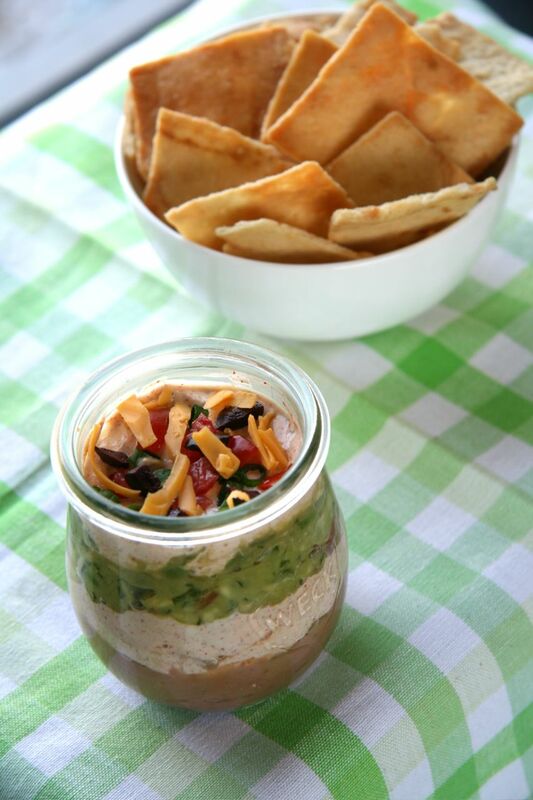 Serve with taco chips or pita chips (our favourite!). I love brunch, and always have. Why?…I don’t quite know. Maybe it’s just relaxing and savouring my morning coffee, instead of chugging it down while I reply to the next “OMGosh-Urgent” email during the work-week. Maybe it’s that I have an excuse to make something a little more gourmet on weekends, when I know CH will be home and his meal won’t go in the fridge. 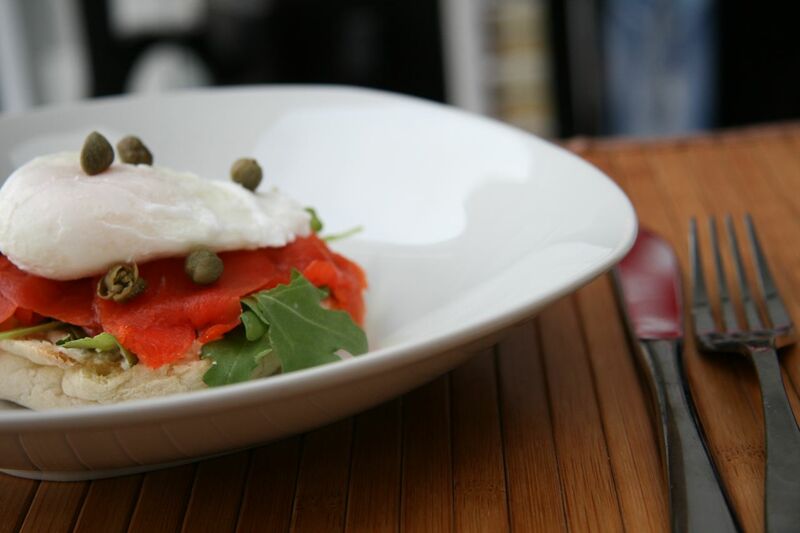 Whatever it is, I love brunch and this recipe explifies why. I love smoke salmon, and again, hailing from BC we’d have it quite often. I remember in my elementary school days, my Mom would pack my lunch for me and I loved the days when it included a bagel with the smoked salmon cream cheese. Yumm! I also love candied salmon, but that’s a whole other story for another day (and perhaps another recipe to try at home!). On a whim (well, it was an inspired whim, which you will see soon! ), I picked-up some from smoked salmon from the market. CH and I enjoyed half of it on Friday night and then on Saturday we had two beautiful pieces leftover. I was considering just toasting up an English muffin and serving it with cream cheese , but then (as per above) I was inspired by the time I had available. I decided to poach some eggs (a skill I have yet to perfectly master), and combine in with CH’s favourite green – arugula – and this is how the dish was born. I topped it with some fried capers, which added a nice crispy texture and a touch of saltiness. I put “bennies” in quotes because it technically isn’t one without the hollandaise – but to be honest, this dish didn’t need it. With the richness and creaminess from the egg yolk and cheese, it’s a perfectly balanced dish (but if you love hollandaise, feel free to add it – Pioneer Women has a great recipe that makes it fairly easy to prepare at home). Either way, it’s gourmet and delicious. I may have to buy smoked salmon more often as this dish was definitely well received in our house. 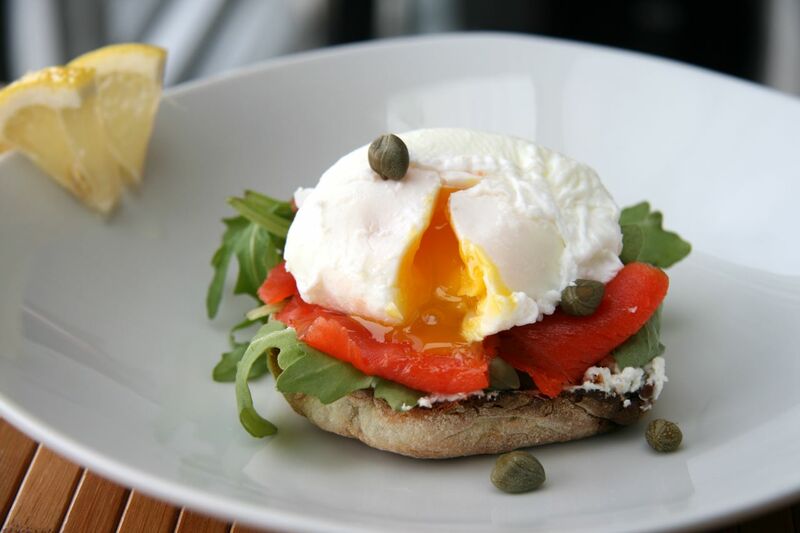 Follow Smitten Kitchens directions on how to poach eggs (she writes it much clearer than I ever could). Link is HERE. You can also fry your eggs, by heating cooking spray or oil over medium-high heat and cook the eggs sunny side up, until the yolk is at your preferred doneness. While you are poaching your eggs, toast your English muffins either under the broiler or in a toaster. When they are ready, spread your cream cheese (or goat cheese) on top. When you are ready, assemble by placing the arugula on-top of the cheese, next the smoke salmon and then the eggs and capers. Season with S&P and enjoy. Enjoy with your morning coffee or a fun mimosa! Remove capers from the jar and place on paper towels. Dab gently to remove all of the excess moisture. In a small frying pan, heat the olive oil over medium-high heat. When it’s almost at the smoking point (be careful & watch it closely), add the capers and fry until crisp and slightly golden brown. Remove the capers from the pan and place on a clean piece of paper towel to drain off excess oil. Allow to cool slightly and then serve with your favourite dish – such as above.